Male of Pantopsalis listeri, photographed by Simon Pollard, used with permission in Taylor (2013). 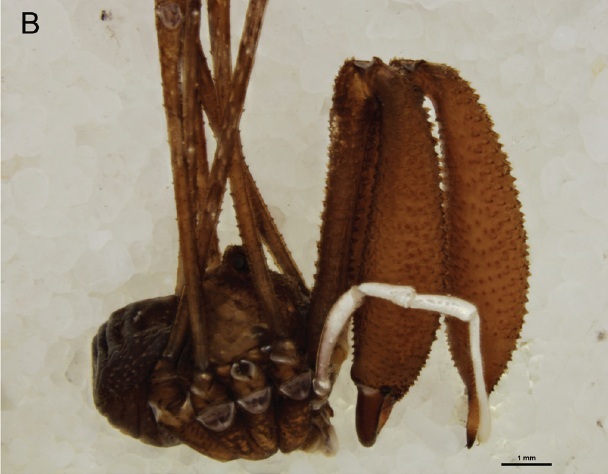 The paper in question is titled 'Further notes on New Zealand Enantiobuninae (Opiliones, Neopilionidae), with the description of a new genus and two new species'. It's been published in ZooKeys, so it's freely available online at the link just given. As well as the two new species of harvestmen mentioned in the title, the paper also does something that I personally am even more pleased with: it manages to make two nomina dubia not dubia any more! It started with my own private little eureka moment. A few months back, I was looking through some of the New Zealand harvestmen material that's been waiting for me to examine it. I pulled out one of the specimens and looked at it under the microscope. And as soon as I looked at it, I somehow had a thought pop into my mind: "That's Pantopsalis cheliferoides". Pantopsalis cheliferoides, I hasten to explain, is a species that was first described in 1882 by William Colenso, a missionary based in Ahuriri in Hawke's Bay. Colenso was a fascinating character, living with one hand firmly on the Bible and the other up a native girl's skirt (he was dismissed from the church in 1852 after fathering a child by his wife's maid, and not readmitted to its services until 1894). He produced the first book to be printed in New Zealand, and was the first to translate the Bible into Maori. He was also a keen natural historian, particularly interested in botany. His endeavours in zoology were perhaps a little less sure: when he collected the first specimens of P. cheliferoides, he doesn't seem to have been entirely sure if he was looking at a harvestman, a whip-spider, or a pseudoscorpion, so he kind of hedged his bets in giving it the name of Phalangium (Phrynus) cheliferoides. Unfortunately, P. cheliferoides then became something of a footnote in New Zealand arachnology. I had looked at the type specimen previously, but it wasn't enough for me to be sure of it's identity (and at the time, I was still a student and not confident enough to perform a genitalia dissection on a holotype). But it was enough that, when I came across more specimens of the species, I was able to recognise them for what they were. Hopefully, this will lift the animal that Colenso spent so much time trying to identify* out from its obscurity. *In Colenso's own words: "I have only seen four specimens in the woods, throughout three years, although from my first seeing one in 1879 (which I failed to capture), I have sought most diligently for specimens. In the following year I accidentally, and most unexpectedly, saw another in the same forest, and though I tried long and arduously to secure it without smashing, I failed to do so; it spread out its long flexible legs so prodigiously, that in the end it escaped among the thick vegetation" (Colenso 1882). Male Pantopsalis cheliferoides, from Taylor (2013). The other nomen ex-dubium dealt with in the paper is arguably even more important, as it is the type species of the genus Pantopsalis. This species was first described as Phalangium listeri by A. White back in 1849, in about three lines of text that are completely inadequate to recognise the species in question (with no further locality data given than 'New Zealand'), and the type specimen(s) seem to have since been lost. The species was redescribed by the French arch-arachnologist Eugene Simon in 1879, who placed it in the new genus Pantopsalis. Recently, I was able to borrow Simon's P. listeri specimens from the Muséum national d’Histoire naturelle in Paris; as it turns out, they belong to the same species that I had dealt with in 2004 under the name of Pantopsalis luna. Because the original type was lost, I've designated one of the Paris specimens as the neotype for P. listeri. It isn't entirely certain that Simon was actually looking at the same species as White had been (indeed, as mentioned in the paper, there's some cause to believe he wasn't). But everyone since Simon has followed his lead on the identity of Pantopsalis, and naming one of his specimens as neotype has the advantage of confirming the status quo. 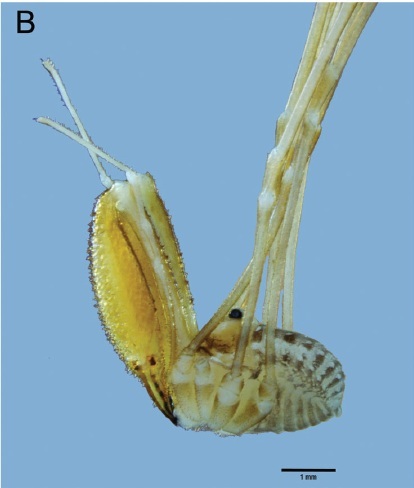 Male of Mangatangi parvum, from Taylor (2013). The two new species in the paper are Forsteropsalis pureora (as it should have been throughout, dammit) and Mangatangi parvum. 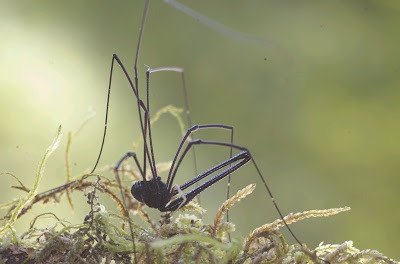 The latter species is particularly neat: it's very small compared to some of the other long-legged harvestmen in New Zealand, and certain features suggest that it may represent the sister taxon to the clade containing the genera Pantopsalis and Forsteropsalis. I'm still doing some work to try and test that. Colenso, W. 1882. On some newly-discovered New Zealand arachnids. Transactions and Proceedings of the New Zealand Institute 15: 165–73.